This is a story that I wrote in 2016 and brushed up in 2017 … I’m going to write yet another version for the newspaper in anticipation of our first big snowstorm of 2019 this coming weekend – but you can read this now! Whenever we have a snowstorm, there’s one question on your mind: How much snow did I get? I hate to break it to you, but if by “how much” you mean “how deep,” nobody really knows for sure. Measuring depth of snowfall is the hardest thing weather observers do. Wind blows snow around, piling it into mounds or scouring it away. Trees grab snow from the air and hold it, then let go all at once. And small changes in temperature or humidity can alter flakes’ size after they fall: waiting a couple hours to measure the storm can lower the depth on the ground. 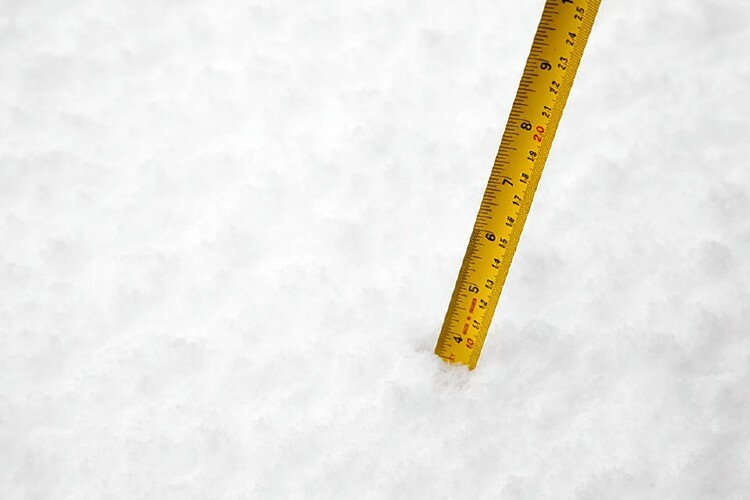 So where and when should you make a measurement to find the “real” depth of snow? In my yard, that depth can change by 6 inches within a few yards, and it’s not obvious which, if any, of these accurately reflects what happened during a snowstorm. Weather observers have developed a system that at least produces relatively consistent results. It involves something called a snowboard, which isn’t what The Flying Tomato thinks it is. “An observer will have a flat board, maybe a foot by 3 – that’s what they measure on. An official observer, every six hours – they take snowfall, clean the board off, then take the measurement again in six hours,” said James Brown, a hydrometeorological technician with the National Weather Service in Gray, Maine, the office that covers most of New Hampshire. The snowboard should be white, to minimize the chance that any after-storm sunshine will heat it up and cause excess settling. There are a handful of official observers for this NWS office, including one in Concord. They get official equipment, including rain gauge and training. The office also has about 100 cooperative observers through New Hampshire and Maine, many associated with a crowd-sourced program called CoCoRaHS, which asks people to measure rain, hail and snow totals every morning. I have been one of those CoCoRaHS people for years, an experience that has led me to regard snowfall depths as estimates rather than exact measurements, because placement of the snowboard makes all the difference. “It’s supposed to be twice the distance from the highest object, but that’s hard to do in New England. We have a lot of trees,” Brown said. Indeed. My snowboard should be 100 feet from the nearest 50-foot maple, but I don’t have that much open space in my property. And if I owned a big open hayfield and tromped into the middle of it every morning to take my measurement, I’d face a different problem. “If it’s in the middle of the field and you get the wind blowing, and it blows everything off the snowboard,” said Brown. Not good. The best situation, he said, is to put the snowboard near – but not too near – a stand of deciduous trees. In winter they’ve lost their leaves, so they don’t hold back large amounts of snow, but they do slow the wind. That doesn’t sound terribly exact, does it? “It’s a difficult thing. You have to use your head about it,” Brown said. In other words, snow depth observers look around their property and try to judge whether the snowboard location appears typical. That’s what I do, although I’ll admit there are times when it feels like I’m measuring a non typical spot. The real problem with snow depth is that it doesn’t measure what happened – the volume of precipitation that fell. It only measures a secondary characteristic: The volume occupied by this precipitation at a certain moment under changing circumstances. They aren’t the same thing, and we all know by experience. Compare 2 feet of light, fluffy snow that you can push off the walkway with a broom, versus 6 inches of heavy, hard-to-shovel snow that has chiropractors rubbing their hands in anticipation of more customers. The former is reported as being a lot more more snow but we know it isn’t really “more” – especially if we’re worried about our roof caving in. The meteorological way around this problem is to use “snow-water equivalent” a measure how much water is contained in the snow. It’s simple. Collect a column of the snowfall in a calibrated receptacle – usually a foot-tall rain gauge that is 4 inches in diameter – and melt it down, reporting the result as if it had been rain. When you do this, you find that the ratio between the depth of snow and the depth of melted water varies enormously. It can be as low as 3-to-1 (which would be brutally heavy snow, indeed) and as high as 15-to-1 (which would blow away if you sneezed). Even more confusing, a warm day will turn one morning’s 15-to-1 ratio into tomorrow’s 3-to-1 ratio. And you’ll notice that the snow-water equivalent still faces the location problem. I gather the snow off my snowboard to melt it, but if my board doesn’t provide an accurate reflection of what fell in my yard, this water figure will also be inaccurate. There is a serious side to this question, too: Dealing with drought. Snowmelt is a contributor to New England’s water table, so it behooves planners to know how much water exists in the snow that will cover the North Country in early spring. Taking snow-water measurements all throughout Coos County is easier said than done, however. Out west, where snowmelt is far more important to water supplies, a system called Snowtel is often used. It involves “pressure pillows” on the ground, which measure the weight of a given area of snow atop them and thus its water equivalent, and sends the data out automatically via satellite. But those systems are expensive and still suffer from the problem that you have to choose one spot to measure and estimate what it tells about all the surrounding area. When all is said and done, lots of estimates over large distances will give you a decent idea of what happened, and lots of snow-water-equivalent measurements will probably even out the errors and provide an accurate picture on a country wide basis. As for answering the question “exactly how much snow fell in my yard?” – relax. It’s virtually impossible to say precisely, so put the yardstick somewhere obvious and consider the result a intelligent estimate. Then go play in the snow, because that’s the best way to judge how big this storm was.